Franchise businesses usually require franchisees to pay monthly or yearly royalties. At The BBQ Cleaner, things are different. We are offering a stellar BBQ cleaning business opportunity in Rhode Island, which allows you to run a business on the sidelines or even on a full-time basis. You will be able to charge your own rates and set up flexible working schedules that fit your lifestyle! What’s more, we have got you covered by preparing a comprehensive business manual. You can rest assured that we are here to support your venture at every step of the way. If you are interested in the grill cleaning business opportunity we are providing in Rhode Island, you may be even pleased to know that it entails an affordable start up cost. You are also not required to possess many years of experience in this industry! Why Start a BBQ Cleaning Business in Rhode Island? Great Weather for Outdoor Grilling: In Rhode Island, you can expect many Hawaiians to be out for countless BBQ sessions. Offer them professional grill cleaning services to ease their burdens. Large Base of Potential Customers: Many Rhode Island homes have their own grills. You can easily see that there is a large base of potential customers to make money from. Lower Rate of Competitors: When it comes to BBQ and grill cleaning services in Rhode Island, it is considered to be a non-competitive niche. You can look forward to little competition. How Does The BBQ Cleaner Help You Get Started in Rhode Island? You will be pleased to know that the business opportunity that we are offering is designed to help you unlock unlimited earning potential when it comes to grill cleaning services in Rhode Island. 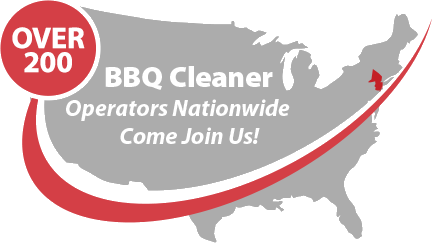 At The BBQ Cleaner, we have more than 180 operators nationwide to date. Our company is established in 2009 and we have achieved a consistent track record of being a global leader in the BBQ and grill cleaning industry. When you work with us, you have the advantage of gaining access to on-going lifetime business support from our company. Talk to us today to find out more about this stellar BBQ cleaning business opportunity in Rhode Island!